Loyola University researchers have identified the key components of a protein called TRIM5a that destroys HIV in rhesus monkeys. The finding could lead to new TRIM5a-based treatments that would knock out HIV in humans, said senior researcher Edward M. Campbell, PhD, of Loyola University Health System. Campbell and colleagues report their findings in an article featured on the cover of the Sept. 15, 2010 issue of the journal Virology, now available online. In 2004, other researchers reported that TRIM5a protects rhesus monkeys from HIV. The TRIM5a protein first latches on to a HIV virus, then other TRIM5a proteins gang up and destroy the virus. Humans also have TRIM5a, but while the human version of TRIM5a protects against some viruses, it does not protect against HIV. By continuing to narrow their search, researchers hope to identify an amino acid, or combination of amino acids, that enable TRIM5a to destroy HIV. Once these critical amino acids are identified, it might be possible to genetically engineer TRIM5a to make it more effective in humans. Moreover, a better understanding of the underlying mechanism of action might enable the development of drugs that mimic TRIM5a action, Campbell said. In their research, scientists used Loyola’s wide-field “deconvolution” microscope to observe how the amino acids they identified altered the behavior of TRIM5a. They attached fluorescent proteins to TRIM5a to, in effect, make it glow. 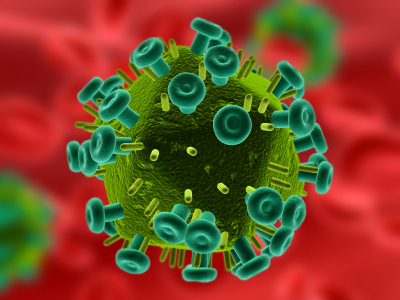 In current studies, researchers are fluorescently labeling individual HIV viruses and measuring the microscopic interactions between HIV and TRIM5a. New research is also starting to reveal just what happens in the body after a massage. While there have long been theories about how massage works — from releasing toxins to improving circulation — those have been fairly nebulous, with little hard evidence. Now, one study, for example, found that a single, 45-minute massage led to a small reduction in the level of cortisol, a stress hormone, in the blood, a decrease in cytokine proteins related to inflammation and allergic reactions, and a boost in white blood cells that fight infection. There has been a surge of scientific interest in massage. The National Center for Complementary and Alternative Medicine, part of the National Institutes of Health, is currently spending $2.7 million on massage research, up from $1.5 million in 2002. The Massage Therapy Foundation, a nonprofit organization that funds massage research, held its first scientific conference in 2005. The third conference will be in Boston next year. The research is being driven, in part, by massage therapy’s popularity. About 8.3 percent of American adults used massage in 2007, up from five percent in 2002, according to a National Health Statistics report that surveyed 23,393 adults in 2007 and 31,044 adults in 2002, the latest such data available. Massage was expected to be a $10 billion to $11 billion industry in 2011 in the US, according to estimates by the American Massage Therapy Association, a nonprofit professional organization.